Saturna Green Systems Inc is a developer of GPS and wireless technology and today they have announced the launch of what it calls the first intelligent, connected electric scooter. The scooter is being demonstrated at EICMA Milan and is named the Vmoto e-max 120L-D. It benefits from onboard components to help it function. The first is the vehicle digital dashboard which is designed for safe and efficient rider interaction. The second is the vehicle onboard processor which has 3G network connectivity, Bluetooth and even Wi-Fi for use with smart phones and other mobile devices. The third component is the vehicle monitoring and controlling hardware. It is this component that integrates with the battery, systems and motor controllers. 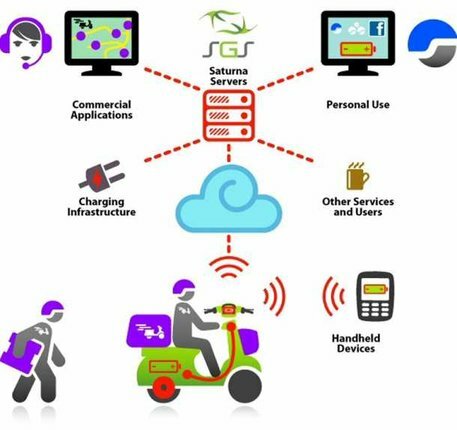 There is then the Saturna's management system which is a web-based, GPS location-based services system that has been designed with 2 wheel electric vehicles in mind. These component allows for some amazing new technological advances. For example, the digital dashboard will allow riders to interact with other scooter riders, check their routes and power consumption and even protect from theft. All this information can also be accessed remotely on any web-enabled device. The features could all be extremely useful for the likes of the postal industry and police. The messaging functions alone could drastically help in these industries and the use of automated dispatching and choosing the most energy-efficient routes could save fortunes. The additional safety and security features would also be welcomed as they would not only help to protect riders but also to protect costly cargo. The Saturna platform also takes battery life to a new level meaning that the old problems associated with electric vehicles, such as short battery range, are a thing of the past. There is now also a growing infrastructure providing charging facilities and battery services which work to make the use of an electric vehicle even more appealing and realistic. Saturna's highly technology platform is aimed at two-wheel OEM's and their consumer and commercial customers. It is scheduled to go into full production for mid 2012 and talks are currently underway with several manufacturers to carry out the product build and integration. It is believed that this is just the start of helping the electric vehicle to become a real option for road users and that any electric vehicle manufacture integrating Saturna's new platform gives itself a distinct edge over the competition and a chance to lead the way. It is great to see progress being made in the electric vehicle market and once the Saturna platform goes into full production next year it is expected that a lot more competition and advancement will begin to be seen in the electric vehicle industry, which can only be a good thing. Video Credit: Saturna Green Systems Inc.